The ADB likes to talk about “stakeholders”, “participation” and “consultation”, but the Bank’s review of its forest policy demonstrates that these words have no meaning within the Bank. President Chino promised that the views of the NGOs “would be taken into account”. Unfortunately, in its preparation of its proposed new forest policy, the Bank seems to have forgotten the President’s promise. The Bank claims that it consulted with more than 500 people during workshops in Bangladesh, Pakistan, Philippines and Sri Lanka. In February 2002, when the Bank produced a draft of its new forest policy, 140 people attended a workshop at Bank headquarters in Manila. Before the Manila workshop, the Bank sent its “draft strategic framework” to “about 12 forestry experts . . . for review and comment”. These “experts”, of course, were selected by the Bank. Once the Bank’s draft forest policy appeared, any pretence of public debate disappeared. “Formal external consultation process was concluded with the February 2002 Regional Consultation,” explained Jan P.M. van Heeswijk, Director General of the Regional and Sustainable Development Department at the ADB. “The internal review process is still underway,” van Heeswijk added. This internal review process is precisely the type of elite, closed-door negotiations that the NGOs in Hawai’i were keen to avoid. 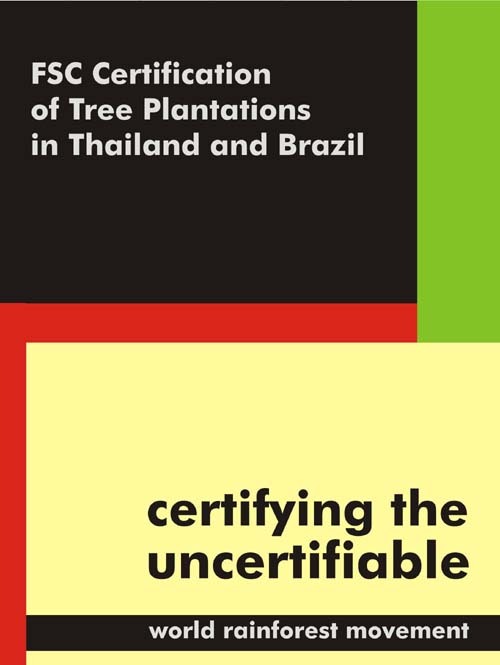 The shortcomings of the Bank’s latest draft forest policy, dated June 2003, are illustrated by its uncritical support of industrial tree plantations. Indeed, one of the objectives of the Bank’s new policy is to “increase the extent and productivity of plantations”. 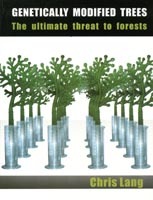 A monoculture eucalyptus plantation, consisting of vast blocks of same-aged trees which are clearcut every five years, has more in common with an agricultural crop than with a forest. 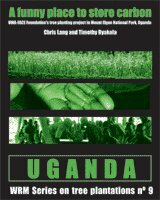 Yet the Bank defines a plantation as a “forest established by planting and/or seeding in the process of afforestation or reforestation”. Thus a forest with 39% crown density is afforded no protection. No explanation is given for the sudden increase in the minimum crown cover from 10% to 40%, although this is a significant weakening of the protection afforded by the policy. The Bank fails to explain what the word “inevitable” means in this context. Nor does it explain how the decision is to be reached that damage to forests is inevitable. A forestry consultant hired by the ADB may decide that replacing large areas of forest, fields, grazing lands and swiddens with monoculture plantations is inevitable. To villagers, whose livelihoods depend on this land, such a decision would be far from inevitable. Because the Bank defines plantations as forests, it fails to provide any protection to forests. If an ADB-funded industrial plantation project planned to replace, say, 50,000 hectares of forest, to comply with the Bank’s policy, the project developers could suggest that they would “reforest” a further 50,000 hectares with industrial plantations. Whether the Bank will also fund this “reforestation” is not clear from the draft policy. In designing its forestry projects, the ADB makes decisions about who will benefit from either using or conserving forests. 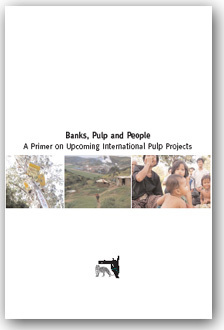 Although the Bank talks about participation and consultation with local communities and Indigenous Peoples, the Bank lends money to, and reinforces the power of, the state. 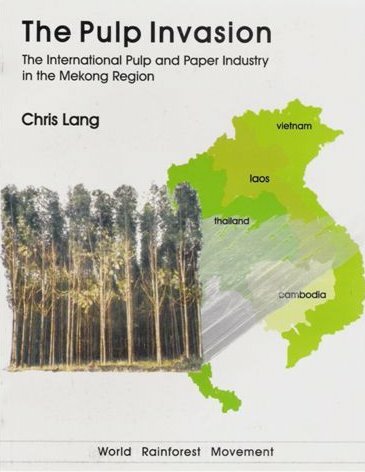 The decision, for example, to replace villagers’ commons, swiddens or community forests with monoculture eucalyptus plantations to produce wood chips for export is not only an economic, technocratic decision. In supporting industrial tree plantations, the Bank makes a political decision to support the pulp and paper industry—often at the expense of local communities, who as a result lose access to their land and forests. But every time the Bank is involved in decisions about how forests are to be used, and by whom, it is involved in political decisions. When Frank Black left his post as Executive Director at the ADB, he clearly acknowledged the political role of the Bank. 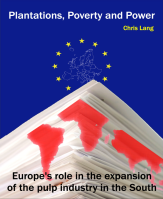 “The ADB’s almost instinctive, institutional response would be to point to its Charter and assert that it has no political role. This is, of course, not the case. The Bank’s advice and lending have political ramifications,” he wrote. Because of the particular importance of forest to Indigenous Peoples it is of crucial importance that ADB’s forest policy addresses and secures Indigenous Peoples’ Rights. The ADB has made its June 2003 draft policy available on its web-site. The Bank “welcomes comments”, which, it assures us, will be given “serious consideration”. The Bank “reserves the right to use the comments” in writing its forest policy and “may publish a list of contributors who have provided comments”. What the web-site does not mention is that the ADB’s Board has already discussed and rejected the June 2003 draft. The problem with the Bank’s internal review process is that it is internal. It is not public. It does not allow participation. The Bank will not make public all the comments it receives. It will not respond to comments. How the Bank will decide which comments are to be included and which are to be ignored is unknown. None of the Bank’s alleged experts will have to face questions in public about the forest policy. In asking for comments, the Bank is doing no more than attempting to legitimise an autocratic process.